The server may be unavailable or the gateway may not be correctly configured. October 27, 2018 by Roger·Comments Off on The server may be unavailable or the gateway may not be correctly configured. You have not access to the Cognos Connection. The IBM Cognos service is running, what it looks like in Windows Services. The cogserver.log is empty since last restart. IBM Cognos gateway can not connect to IBM Cognos BI server. Stop the IBM Cognos Windows service. Start IBM Cognos service again. In a Active Directory Domain and Forrest, when we try to add AD groups to the internal Cognos groups in Cognos Connection – Administration – Security, we can not see all groups. AD Domain Local Groups can only be seen if they are in the same sub-domain as the Cognos Content Manager server. If the Cognos CM server is in a different domain than the DLGroup, it is not visible. You should create a Cognos security group for your function, then to that Cognos group add AD groups from the different namespace you have created to allow users of different forest have access to the Cognos solution. When you configure an authentication namespace for IBM® Cognos®, users from only one domain can log in. By using the Advanced properties for Active Directory Server, users from related (parent-child) domains and unrelated domain trees within the same forest can also log in. There is no cross-forest support; there must be a namespace for each forest. If you set a parameter named chaseReferrals to true, users in the original authenticated domain and all child domains of the domain tree can log in to IBM Cognos. Users from a parent domain of the original authenticated domain or in a different domain tree cannot log in. If you set a parameter named MultiDomainTrees to true, users in all domain trees in the forest can log in to IBM Cognos. => Therefore, only fill in the ‘Binding credentials’ section if your “test” (see later) fails. If authentication fails, specify a Windows user ID and password for the Binding credentials property. • Use the credentials of a Windows user who has at least ‘search’ and ‘read’ privileges for that server. • This should be a domain user who can ‘see’ the folders inside the AD where the users are located. 6. Enable either ‘ChaseReferrals’ or ‘MultiDomainTrees’. This is often the best choice (for performance reasons). If you are unsure where your users will be located, ‘MultiDomainTrees’ can be the best option (to ensure that all users are able to logon, wherever they are located). However, this means that searches will traverse the entire forest, leading to performance slowdowns. 6. Decide on whether to use NTLM (“REMOTE_USER”) or KERBEROS authentication. Do not use this entry if you want to use Kerberos (which is the preferred option for many environments). – universal group membership is replicated to all Global Catalogs (i.e. it has forest-wide replication scope). This can be beneficial (since it provides efficient way to retrieve group members) – but has its drawbacks (it increases volume of replication traffic). – domain local groups do not have any limitations regarding their membership – i.e. they can contain accounts the same domain/forest or any trusted domain/forest. This does not apply to domain global groups (they can contain only accounts from the same domain) or universal groups (they can contain only accounts from the same forest). – universal group is a security or distribution group that contains users, groups, and computers from any domain in its forest as members. You can give universal security groups rights and permissions on resources in any domain in the forest. – global group is a group that can be used in its own domain, in member servers and in workstations of the domain, and in trusting domains. In all those locations, you can give a global group rights and permissions and the global group can become a member of local groups. However, a global group can contain user accounts that are only from its own domain. – domain local group is a security or distribution group that can contain universal groups, global groups, other domain local groups from its own domain, and accounts from any domain in the forest. You can give domain local security groups rights and permissions on resources that reside only in the same domain where the domain local group is located. What files should I save in a backup folder, before I apply a fix pack or do a upgrade of a Cognos BI 10.2.x installation? You should keep a copy of the original file you change with the ending .org like system.xml.org. Then you should copy your updated file with a ending like .ibm – then if the fix pack overwrites your system.xml file you have a copy of the file in system.xml.ibm, that you can copy back after the updated. <c10_install>\bin\ The file in this location is used by Report Server for PDF and Microsoft Excel spreadsheet software outputs. <c10_install>\webcontent\schemas\ The file in this location is used by IBM Cognos Viewer for HTML output. <c10_install>\reportstyles\ The file in this location is not currently used. <c10_install>\webcontent\reportstyles\ The file in this location is used by Report Studio. Include the date, when you saved the file, in the filename. How update the toolbar with links? You need to update the system.xml file. This is found in folder C:\Program Files\ibm\cognos\c10_64\templates\ps\portal\system.xml on the Cognos BI report (dispatcher) server and on the Content manager server. It is the Cognos Presentation service that create the web-page, so where this is running (true) there the files will be read. Best is to update it on all Cognos instances. You can add user interface elements to IBM Cognos Connection to connect to external applications or to modify the functionality of IBM Cognos Connection. You can restrict access to these new user interface elements based on different user groups and roles. To add a user interface element in IBM Cognos Connection, you must modify the portal system.xml file. The xml:lang attribute of the label and tooltip elements in the system .xml file corresponds to the product locale in use at the time of the portal page generation. If a new product locale is added for IBM Cognos software, you must add a translation for the label and tooltip fields. When no label or tooltip is found that matches the product locale, nothing is displayed. The graphic that is referenced by the icon element must exist in the c10_location/webcontent/ps/portal/images directory. 1. Stop the IBM Cognos service. 2. Open the c10_location/templates/ps/portal/system.xml file in an XML or text editor. 4. Within the <param name=”ui_add”> element, define all the custom elements that you want to add. 5. For information about all the user interface elements that you can add, see the topic ““Elements You Can Add”. Ensure that you match the case of each user interface element that you want to add. 6. Specify one or more groups or roles that you want to access the new interface element by adding their IDs as values of the show attribute. Use the IDs as documented in the topic “Referencing the required groups or roles in the system.xml file”. Separate the IDs using spaces. 7. Save the system.xml file. 8. Restart the IBM Cognos service. Tip: You can have only one <param name=”ui_add”> element in the system.xml. Therefore, all items that you want to add must be placed inside this element. If we want to create and modify classes that apply to all reports, we can modify the global Cognos style sheet. This is a useful strategy if we only have one corporate style for all reports. There are four versions of the global Cognos style sheet as shown in Table below. The exact CSS file used will be chosen based on how the report style is set for a given report. 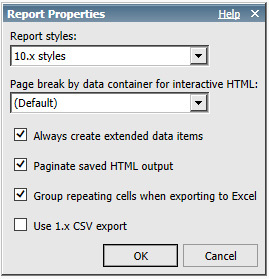 The default setting for IBM Cognos BI 10 is 10.x styles, as shown in Figure 8. You can open this dialog by selecting Report Properties from the File menu in IBM Cognos Report Studio. Each of the four CSS files identified above is installed by Cognos in four different locations, as shown in Table below. Files are on both gateway and dispatcher (app) servers. Update the file GlobalReportStyles_10.css in all above folders. 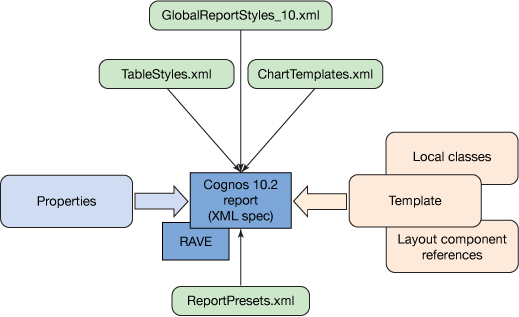 In the following example we will modify the IBM Cognos 10 BI global style sheet GlobalReportStyles_10.css. This style sheet is used by Cognos Viewer for HTML output. The following steps are a simple modification where we will modify GlobalReportStyles_10.css to increase the font size. On your IBM Cognos BI 10 server, find the file named <c10_install>\webcontent\schemas\GlobalReportStyles_10.css. Copy this file and save it as GlobalReportStyles_10_BU.css. Open the original GlobalReportStyles_10.css in a text editor. Find the text .ls /* list */. Scroll down to font-size: 8pt; and change it to font-size: 28pt;. Clear your browser’s cache and restart Report Studio. Create a new List report with any data source.Select the List object and view its properties. You will notice that the Font property is empty. Click the Run Report toolbar button to preview the HTML output in Cognos Viewer. It will pick up the new 28pt font size at runtime. CAM-AAA-0064 The function ‘bindToBestGCServer’ failed. When a user from a different domain than the servers are in, try to login to Cognos Connection, they get this error message. There are two Microsoft Windows domains, Domain A and Domain B, that have a forest trust. 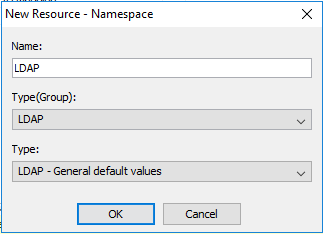 In Cognos Configuration you have setup two namespace – one for Domain A and one for Domain B. The Cognos servers are in Domain A. On the Microsoft Windows server IIS manager you have set Windows authentication on the CGI-BIN folder for the Cognos Gateway. The user selects the namespace he want to login to first when he reach the cognos connection webpage. + In the Value – Advanced properties window, click Add. …to make the login work. If you have also enter multiDomainTree=true you get above error. Solution is very depending one your network infrastructure setup, you need to test different configurations. If you set a parameter named chaseReferrals to true, users in the original authenticated domain and all child domains of the domain tree can log in to Cognos. Users above the original authenticated domain or in a different domain tree cannot log in. If you set a parameter named MultiDomainTrees to true, users in all domain trees in the forest can log in to Cognos. How to determine the Service Pack of the Cognos Business Intelligence product installed? The component list cmplst.txt file displayed a full list of installed components. It is found on any server with a full or partial installation of Cognos Business Intelligence. Within this file, look for [Product Update Information]. If this section is missing or blank, then you have the RTM (first release) installed. If the section is populated, reference the table above to determine the service pack installed.